Let’s talk about terps! Scientists have identified more than 50,000 terpenoids, which are used as in perfumes, insect repellents, and even modern medicine. Think of smells such as menthol, citrus, and many other spices. Cannabis naturally has over 200 terpenes, and depending on their unique combination in any particular strain, you’ll find it affects your body, mind, and general well-being differently. Researchers at the University of Bordeaux discovered that THC interacts with the olfactory bulb, the primary smell center of the brain. By stimulating our sense of smell and taste, THC makes food more enjoyable. Also, THC binds to cannabinoid receptors in the brain called CB1s. This binding inhibits signals telling us that we are full, thus we generally feel hungry and eat more than we otherwise might. Whether you’re looking to increase your appetite or shed a few pounds, there’s a strain for you. Certain cannabis strains with limonene and humulene (combined with THCV) have been shown to promote weight loss. But wait there’s more! Limonene may also aid digestion, ease constipation, promote circulation, and increase vitamin C absorption. Humulene has anti-inflammatory, antibacterial and even anti-cancer properties. That’s right – at a molecular level, humulene creates oxidative stress (think free radicals) on cancer cells, which is effectively toxic to cancer cells. And as a bonus, humulene has been shown to work synergistically with another terpene, beta-caryophyllene, in delivering humulene to cancer cells, thus increasing the efficacy. That’s fancy scientist-type speak for, It makes it work even better. Cannabis products in Oregon have to be lab tested, so when you’re shopping, ask for their test results and look for combinations of terpenes that will work best for you. Keep in mind that some products (see our post about Distillate) just aren’t going to have many terpenes, if any. 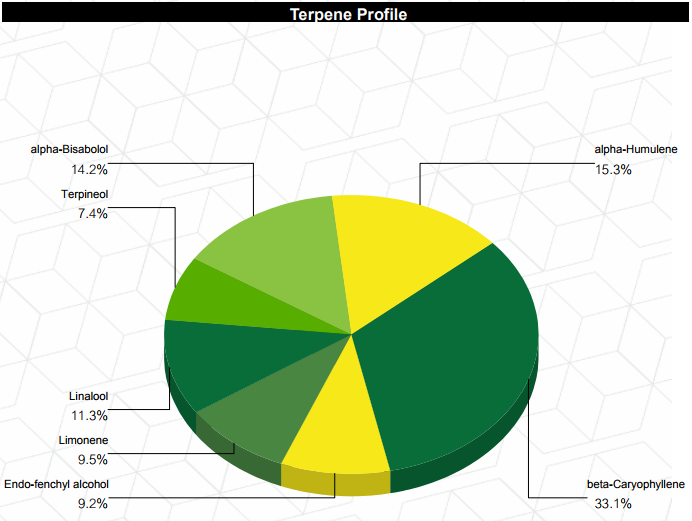 If you’re curious about the terpenes in High Desert Pure’s crafted CO2NCENTRATES, our results have the terpenes included. Visit our test results page and download a test for yourself. We find ourselves in awe marveling at the natural properties found in cannabis. It’s why the terpenes in our extracts are untouched; the way nature intended them. We feel so strongly about providing a pure product that we literally built a company around it. If you’ve got questions about terpenes (or anything else cannabis related), send them our way. We’re out to make everyone’s cannabis experience the best it can be: pure, simple, and awesome.